Recently, Elizabeth has been ordering popiah to share during lunch, we've eaten those from Food Republic & Malacca Cafe in 313@Somerset. Today early lunching alone @ Plaza Singapura I thought I buy 1 as snack in the office later. 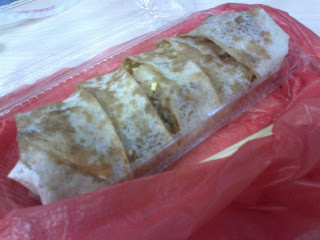 While eating, suddenly I remember my younger days, the days when Mum decides that "today is popiah day". We will be excited about it (or at least I am) coz Mum's popiah is truly yummy. I love to wrap my own popiah but I prefer Mum to do it for me. Somehow the ones that she wrap tastes million times better then the one I did it even though we are using the same ingredients n sauce. I especially love Mum's chili; she laborously pound the chili padis n mix them with some thing (i forgot what, must ask her). I remembered I had it as lunch n dinner~ woot~ yummy! I remember I had a popiah gathering during my ITE days too. The few of us gathered at Christin's house n pig out (^^,) Of coz Auntie prepare the ingredients while we do the eating. We just wrap eat chat drink play mahjong. Come to think of it, a dish that costs less then $10 to gather the ingredients needed to complete it, but can make so many to feed a village can cost so much per piece! $2 - $2.50 per piece... no wonder every where you turn you see stalls selling this very profitable dish.